To commemorate Woman’s Day, China Cultural Centre is presenting ‘Nature, Man and the Cosmos: Dialogue – Ya Li (1973-) and Catherine Cavallo(1963-)’. The inauguration on Thursday 8th March 2018 is being held in the art gallery at the China Cultural Centre at 173, Melita Street, Valletta. The exhibition opens to the public from the 9th to 20th March 2018. Ya Li’s expression is spiritual, poetic, lyrical, gentle, delicate and peaceful. Nature predominates but man, perhaps diminutive is present without intruding. Nature abounds. There is space too, a kind of paradise or legend, a Garden of Eden. Her work emanates a contemplative, meditative and magical feeling, a deep sense of tranquility and serenity. There is a kind of symbiosis or rather a certain unison or better still an empathy with nature. She expresses a sublimation of feeling, a contained but not suppressed sentiment. She creates movement in repose. Ya Li economises with a reduced palette of monochromes, with a prevalent use of green, jade and turquoise; at times her painting resembles a duo print of two balanced colours. 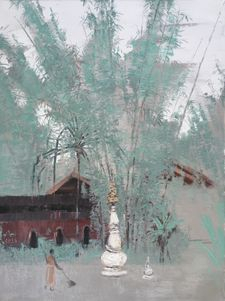 Her choice of palette is therapeutic, restful; it produces a sense of peace, relaxation and rest notwithstanding her animated scumbling or dry brush technique. Scratching into the caked paint with the wooden tip of the brush feels more like a whisper than a shrill cry. Van Gogh and Monet's influence with a modern interpretation are implicit but there is also a mix of traditional Chinese concepts especially in the triangulation of nature, man and the cosmos. She expresses great rhythms of nature, a profound symmetry, harmony, and sense of proportion. It is a pure polarity: this attraction and repulsion of forces. With Catherine Cavallo there is a great effusion of emotion, an unbridled expression of passion, a strong, vigorous, palpitating movement, a hustle and bustle of people, a thronging crowd of seething humanity. Man dominates nature and space. Her romantic expressionism is heavily contagious. Her vigorous brushstrokes leaves one breathless, her use of dark chromatic colour adds to her passionate approach, her caked paint produces a rough dynamic texture, her bravura and virtuosity intensifies drama, atmosphere and mood and her vigorous brushstrokes produce sustained movement. Her work is physically tangible, actual, realistic and naturalistic. What a contrast to Ya Li’s work. Almost a dichotomy! Yet there is a dialogue about nature, man and the cosmos. Ya Li’s vast spaces become constricting in Cavallo as humanity in the latter is spectacular, monumental, heroic. Cavallo destroys the precarious balance and produces strain, stress and tension. The world of Cavallo is imperfect when compared to the perfectly ideal one created by Ya Li. The world of Ya Li is mainly the domain of trees, gardens and groves, marshes and wetlands, pastures and woods, lakes and rivers, temples and architecture, and mountain ranges. Animals: peacocks, yaks, horse, fowls, and fish seem more important than man while the trees she depicts: bougainvillea, cherry apples, fir, chili peppers and bamboo show her love of vegetation. With Cavallo people take center stage though she waxes poetic about almond trees, tulips, lotus and pigeons. She reaches a poetic peak in her landscapes of the sister island, Gozo. It is fascinating to compare the ‘Wind Amidst Cherry Apples’ and ‘Bougainvillea’ by Ya Li to the ‘Almond Blossom Tree’ by Cavallo. The ‘Moon over St. Paul’s Bay’ by Cavallo has an affinity with the tragic landscape of Toledo skyline by El Greco. ‘Fixing Nets’ by Ya Li is the most expressionistic of her works and is the nearest or closest to the tension as expressed by Cavallo in depicting pigeons fluttering around a waiter in front of our spectacular National Library. But the sustained movement in Cavallo is in stark contrast to the movement in repose as expressed by Ya Li. The difference in vision and concept between the artists, surfaces most in ‘Celebrating L-Imnarja’ a painting by Cavallo in its gothic vulgarity when compared to the idyll and the ideal perfect enclaves of nature’s beauty in Ya Li. It is such a wonderful opportunity for Ya Li to expose her work to the local public and foreigners. And for Catherine Cavallo it is a golden opportunity to promote her work to the Chinese and tourists in our midst.